When Britain became involved in the First World War in August 1914 sending The British Expeditionary Force to France there was a widespread belief that it would be over by Christmas 1914. Young men volunteered to go and fight the ‘Hun’ and do ‘their bit’. As the realisation of a long drawn-out deadlock became reality and the numbers of the volunteers, one million by January 1915, was not enough to keep pace with the mounting casualties the question was how to maintain a regular and sufficient supply of recruits was causing great anxiety to the authorities. It was estimated that at least 30,000 new men were required every week to make up for ‘wastage’. By September, 1915, the voluntary system had apparently almost exhausted itself. There were over two million single men of military age, as well as married men who had failed to answer the call to arms. However, later towards the end of 1915, the government under Herbert Asquith, saw no alternative but to increase the number of men into the armed forces by conscription. Parliament was intensely divided but in view of the state of the war in France and Belgium, they had no alternative but to pass the Military Service Act in March 1916, the first of two Acts imposing conscription on men between the ages of 18 and 41. The first Act was for all single men and the second in May 1916 was extended to married men. The acts applied to England, Scotland and Wales but did not apply to Ireland because of the Easter Rising 1916. Nevertheless, in the first year after conscription over one million men enlisted. However there were those who did not answer the call for a variety of reasons including health, already doing important war work, or moral or religious grounds. Men who appealed on moral or religious grounds were called Conscientious Objectors (Cos). Pacifist members of the No-Conscription Fellowship, set up in 1915, successfully campaigned to secure 'the conscience clause' in the 1916 Conscription Act: the right to claim exemption from military service. A conscientious objector is an "individual who has claimed the right to refuse to perform military service" on the grounds of freedom of thought, conscience, disability or religion. In general, conscientious objector status is considered only in the context of military conscription and is not applicable to volunteer military forces. Not until 1916 when conscription was introduced did the words conscientious objection enter the language because until then it was all about joining up voluntarily. Their only way of contesting the ‘call up’ was to go before a local Military Service Tribunal (MST). These had been set up in 1915 under Lord Derby’s scheme, to hear claims for deferring call-up. Their appeal to the MST could be granted on the grounds of moral or religious and the tribunal could grant an exemption, absolute, temporary or exemption from combatant service. The local MST had jurisdiction over its local area. The tribunals were intended to be humane and fair but it was left to local councils to choose the people who actually sat on the panels, and they often selected themselves, “Tribunals were intended to be independent judicial bodies composed of fair minded citizens they were more likely to be made up of elderly local business men former civil servants and policemen clergymen all members of the middle class. With few exceptions they brought their age and class prejudices with them along with those firmly behind the country and its commitment to the war.”  Mostly were strongly patriotic and therefore prejudiced against anyone whom they thought was not. Similarly women seemed particularly incensed by the Cos point of view. In the period shortly after the introduction of conscription, men who claimed to be conscientious objectors found it difficult and were often ridiculed, called cowards and some were physically abused. According to contemporary commentators, the MSTs helped to augment the extraordinary number of young men who converted to new religious fellowships, societies and Quakerism in order to avoid being sent to the Front. They were also vilified by those men already serving in France. A letter sent home from the Front clearly illustrates the thoughts of one officer on conscientious objectors. Cyril Pearce’s ground breaking work on conscientious objectors concludes that, there is no accurate assessment of the numbers of Cos in the UK as a whole. The data is based on fragmentary, flawed or non-existent material, biased and open to conflicting definitions. Many of the tribunal’s paperwork has been either destroyed or lost, with some notable exceptions such as Huddersfield, Northampton and south Warwickshire. Nottinghamshire, unfortunately is one area where there is no trace of the MST. However, referencing the local paper, The Nottingham Evening Post, reveals the names of men who claimed conscientious grounds for not joining up and some indication of what happened to them after their appearance before the tribunal. Further investigation concludes that there were at least 253 men registered as Cos in Nottingham after 1916. They came from all walks of life and were placed in a number of different occupations throughout the war. The Church of England supported the war so it not surprising that many of the 253 men listed as Cos in Nottinghamshire were of a strong religious background, including Quakers, Christadelphians, Congregationalists, Jewish, Seventh-Day Adventists as well as some who were Church of England. Others were listed as Atheists, believers in God, members of the Independent Labour Party or just religious. Each one has a story and a reason for claiming to be a Conscientious Objector. In this article I have selected some of the 20 Nottingham men who became members of the Friend’s Ambulance Unit (FAU), which was a civilian volunteer ambulance service set up by a group of Quakers during World War I. Its members from 1914-1919, were both Quaker and non-Quaker, but mainly Quakers or who attended Quaker meetings. They came from diverse backgrounds, such as Felley Priory, home of the Chaworth-Musters; an academic from Oxford University; three brothers who lived on Alfreton Road and a railway clerk from Nottingham. Harold Adair Armitage, was 30 years of age in December 1915 when he joined the FAU. His FAU service card states he was single living with his father at 5 Derby Terrace, The Park, Nottingham and was a member of the Society of Friends. He was given an absolute exemption on the grounds of his conscientious objection. He was a draughtsman by trade and was a useful member of the service because he had a St Johns first aid certificate, he spoke a little French and was an electrical and mechanical engineer. He began his service at Kursaal, Dunkirk  on 7 January 1916 as a mechanic. He served also at Parc St Georges, Kortrijk, Belgium and Steenvoorde, northern France as a mechanic until 1/2/1919 when he left the unit. Frederick Berwyn Goosey, a 32 year old clerk to the motor trade, of 222 Wilford Road, Nottingham, was given a conditional exemption, certificate number 428, in June 1916 to join the FAU. From August 1916 until his discharge in December 1918 he worked on farms near Oakham and Stamford. Joseph George Bliss, a 17 year old railway clerk of Albert Road, Lenton, Nottingham was a Quaker who attended the Nottingham and Mansfield Houses for monthly meetings. He was a single man. At his Military Service Tribunal he was exempted from combatant service on the condition he worked with the FAU. He had first aid training through the British Red Cross Society and he went to Dunkirk working as an orderly on Ambulance Train 16  in November 1917 and was discharged on 25 February 1919. Two more brothers were also members of the FAU. Artin Der Stepanian and his brother, Walter, both living in the Meadows, Nottingham. Although there is information on Artin, there is less on Walter. Artin was a 16 year old audit clerk whose father was a Turkish Armenian and his mother English. He was granted an exemption from combatant service on condition of joining the FAU in September 1918 where he was sent to Boulogne where he served as an orderly on Ambulance Train 5 until his discharge in February 1919. Alfred John Dodd of Felley Priory, Jacksdale, Nottinghamshire was a pharmacist. He was 34 years old and a single man. He was not a Quaker but was granted a War Office certificate 280 in March 1916 to join the FAU. He was fluent speaking in French and had a St John’s first aid certificate. He served as a pharmacist throughout his service at Ypres, Hazenbruck  and Abbeville  . He left the service in February 1919. Eric Hollingworth England and his elder brother Noel, both of 4 Park Street, Nottingham and single men, were granted conscientious objector status; Eric was granted an exemption from combatant service if he joined the FAU, whereas Noel was already serving in the FAU and claimed an absolute exemption but was only granted an exemption from combatant services. Eric was an analytical chemist whereas Noel was a warehouseman. Their parents were members of the Quaker movement and Eric was a regular attender. There is no mention of Noel attending any meetings. Noel was granted a War Office certificate no 329 in November 1916; he had some knowledge of the French language and treating wounds and held a St John’s first aid certificate. He served in Dunkirk as an orderly from March 1916 until January 1919. His brother Eric could speak French and he too had a St John’s certificate. He served at Boulogne as an orderly from April 1918 until February 1919. A further set of brothers, were James Allan, aged 28 years and Robert Keith Linday, 27 years. James was single and an engineering foreman and member of the Society of Friends. 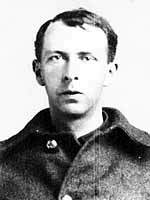 He received a war office exemption and was an orderly from November 1915 until his discharge in January 1919. From June 1917 until his discharge he was a steamer orderly. His brother, Robert, was a married man and was given an exemption from combatant services to join FAU. He was posted to the Queen Alexandra Hospital, Dunkirk, in October 1918 where he served as an engineer until his release in January 1919. William Pickard, a 24 year old wholesale grocer from Mansfield. He had already been accepted for training with the FAU but appealed on grounds of CO, and was given an absolute exemption providing he worked with the FAU. He could drive and was a member of the Society of Friends. He had a variety of occupations during the war years; he was an orderly in 1916 and then joined a hospital ship  and then worked in Queen Alexandra Hospital. In 1918 he twice worked in construction at Porte Synthe but then went back to working in the hospital until his discharge in January 1919. 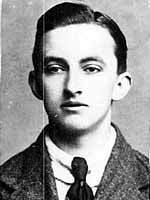 Harold King Price, a 23 year old dental student joined the FAU in March 1916, having had his claim to the Basford Rural MST for exemption from combatant services and non-combatant corps refused. His father is recorded as a farmer of East Markham, Newark in 1911. Harold was an attender of the Friends and was accepted into the membership shortly after joining the FAU. 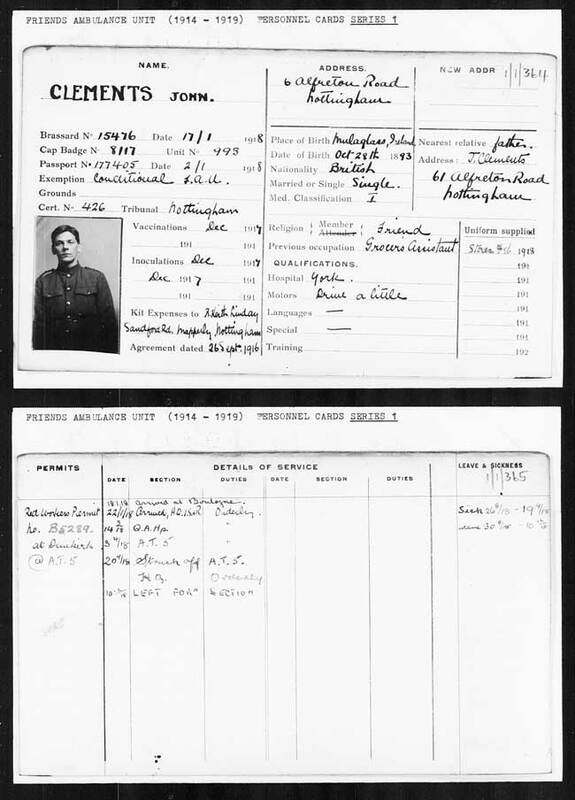 His records are sketchy and give little detail what he did during the period of time he was in the FAU; he was classed as an orderly and served at King George Hospital and Haxby Road Hospital, York  until 1918. Walter Reginald Houseley, a 21 year old junior clerk to the Divisional Superintendents Office Great Northern Railway, was given an exemption from combatant services in March 1916 and recommended by the tribunal for work with the FAU. In August 1916 he was posted to the King George Hospital and went to Dunkirk on 13 February 1917. He served as an orderly at Queen Alexandra Hospital, Dunkirk until October 1918. He was demobilised in January 1919. The men listed above are but a few of the 253 Conscientious Objectors listed in Nottinghamshire. The majority claimed to refuse to take the colours because of religious motives, but there are some who were Trade Unionists or members of the Independent Labour Party. Unfortunately the MST records which would give more information on area such as the arguments given by the CO and reasons given for the decisions made, are no longer available for Nottingham so it necessary to look elsewhere for details on these men who only in the last few decades have become more accepted into history. Newspapers give some information but tend to be brief. Enquiries with the Society of Friends, Nottingham have so far revealed nothing. All of the men, except one, who joined the FAU was single. Among these men were several sets of brothers and it is interesting that of the Linday brothers the single one, James Alan was given an absolute exemption whereas the married brother was only excused from combatant services. All of the above men were members of the Society of Friends and claimed exemption from combatant services. The Military Tribunal Records for Beeston are not very helpful but the others have more information contained in them. Details of men who volunteered for the FAU. Cyril Pearce, Comrades on Conscience : The story of an English community’s opposition to the Great War, 2001, Bath Press. (The most comprehensive book on Conscientious Objectors) He has a comprehensive register of all known men who volunteered for the FAU. John Bucknell, 'The conscientious objectors of Northampton during the First World War', Local Historian, 46/3, 2016. Nottingham Evening Post, 18 September 1916. Nottingham Evening Post, 14 September 1916. The First Anglo-Belgian Ambulance Unit, later Friends Ambulance Unit, set out for Dunkirk on 31 October 1914. Headquarters were established at Hotel du Kursaal, Malo-les-Bains on 2 November. These may have been placements doing agricultural work, if it was after mid-1916, as this work became common for COs who were not fit for ambulance work. The General Service Section was part of the Home Service Section. It was established in 1916 and was a direct result of the Military Service Acts of that year. The section organised work for conscientious objectors who for financial or other reasons could not join the FAU. Mostly, the men undertook agricultural work organised by the Agricultural Sub-Committee, but they also worked in education, welfare, building construction, surgical appliance making, forestry, flour-mills or food factories. Jordans was the location of the FAU training camp for all men before they went off to work; London office is the London office of the FAU, based at Weymouth Street, which organised all the logistics, applications for membership etc. There are some papers which Hughes kept at Aberystwyth and Oxford which are currently held in the Manuscript Department, Leeds. They include notes from lectures given by Professor W J Brown at Aberystwyth and by Professor Henry Goudy and Professor Paul Vinogradoff at Oxford. The greater part of the material is on aspects of Roman law. FAU Ambulance Trains provided relief behind the British front.